With a six-game title run in 2016, Alabama solidified its hold as the best team historically for the Ear of Corn traveling championship in college football, which began in 1979. But the holder of the title now is Clemson. 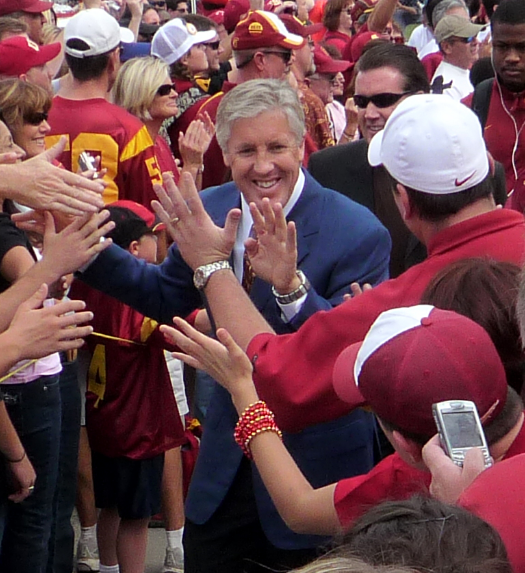 Pete Carroll on the Trojan Walk during his days at Southern California. Carroll has won 26 traveling championship games in the college ranks, more than any other coach. Carroll and Nick Saban are the only football coaches to win the traveling championship in both the college and professional ranks (Bobak Ha'Eri/Creative Commons Attribution 3.0 Generic license). The Ear of Corn has kicked around college football for 38 years, and this traveling trophy has traveled a bit. Nearing 500 games since this traveling designation was introduced in 1979, the prize has changed hands more than 120 times. The ear changed hands four times in 2016, a fair amount. Some years, it never switches. It also has changed hands as many as seven times (1981, 1987, 1989, 1990). A team that's good with the ear will defend it several times, so you wouldn't expect four of this championship's best teams historically to hold it in the same year. But it worked out that way in 2016, with Texas Christian, Texas A&M, Alabama and Clemson all having a turn. 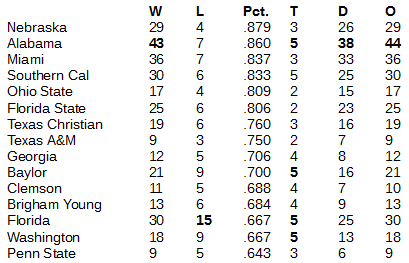 All four programs are the top 15 by historic winning percentage in the Ear of Corn. Ledger for these standings: W – Wins. L – Losses. Pct. – Winning percentage. T – Titles. D – Title defenses. DO – Defense opportunities. Bolded numerals indicate all-time leadership. The 2016 season began with Texas Christian, which notched 17 Ear of Corn wins in 2014 and 2015 to storm into the historic top ten. But the Horned Frogs could only hold it for one week last fall, a 59-41 opening game win against South Dakota State. A week later, Arkansas went into Forth Worth and pulled out a 41-38 win in two overtimes, giving the Hogs the ear for only the second time ever. Arkansas beat first-time suitor Texas State, 42-3, for its only title defense before losing at home, 45-24, to Texas A&M at Fayetteville on Sept. 24. The Aggies made two defenses before falling to Alabama, 33-24, at Tuscaloosa on Oct 22. With that, the Crimson Tide captured the title for a fifth time, tying Southern Cal, Baylor, Florida and Washington for the most championships all-time. Moreover, Alabama has defended the title 38 times, breaking a tie with Miami (FL) for most ever at 33. The Tide now is up to 38 title defenses in 44 defense efforts. There's always a little asterisk on these numbers for Alabama, though. When this project began before the 1979 season, Alabama was an 11-1 national champion in 1978. Alabama was the obvious pick to be the provisional champion, the team that would start the Ear of Corn until someone took it away. As provisional champion, Alabama would not be credited with a championship that time, but it would be accountable for the title defenses. 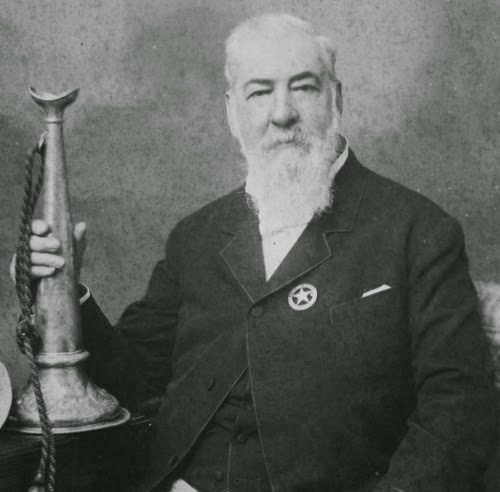 Alabama turned out an excellent choice as the provisional title holder. The Tide held the title for 19 games, finally losing to Mississippi State, 6-3, on Nov. 1, 1980, in Starkville. As the first true Ear of Corn champion to earn it on the field, the Bulldogs made two strong title defenses within the Southeastern Conference before losing it to Nebraska, 31-17, in El Paso in the Sun Bowl on Dec. 27. Nebraska botched its first title defense during the opening week of the 1981 season at Iowa. However, the Cornhuskers have gone on to a 29-4 record in Ear of Corn games (.879), just ahead of Alabama (43-7, .860), Miami (36-7, .837), Southern Cal (30-6, .833), Ohio State (17-4, .809), and Florida State (25-6, .806) as the top winning percentages all time. Alabama went to the national championship game this January holding the Ear of Corn, the first time since 2009 that the ear was in the big game. But Clemson won the 35-31 thriller. Clemson now has the Ear of Corn, winning it for the fourth time. The Tigers are 11-5 for the ear, 11th all time with their .688 winning percentage. The Tigers can move up these standings with a winning streak. They will put the Ear on the line with their opening game of the 2017 season, Sept. 2 at home against Kent State. Following are the 2016 results in the college football Ear of Corn. All-time results can be found here.